I have some bright news for all my fellow marijuana growers out there who are worried about the privacy, assembling, and/or maintaining the best-growing environment – cheer up, buddies, because a weed grow box might be everything you need for a happy and trouble-free cannajourney! If that sounds like something too good to be true then you obviously need to catch up with the advantages of a grow box for weed. Luckily, you are reading those lines for a purpose and after you finish this article, growing your very own premium marijuana will seem much more achievable, fuss-less and joyful. Let’s dive into everything you need to know about grow cabinets and start your cannaventure with confidence and a smile. The reasons for keeping your marijuana growing operation are numerous. Maybe you have conservative parents or conservative friends, or maybe you are just getting started and you feel perplexed with the multiple setups that you need to make to start with, or maybe you are not able to keep monitoring your indoor cannabis growing space every single day. I remember how I started my first cannabis growing and since it was many years ago, I sincerely wish that grow boxes existed! There is literally nothing as discreet as a weed grow box. 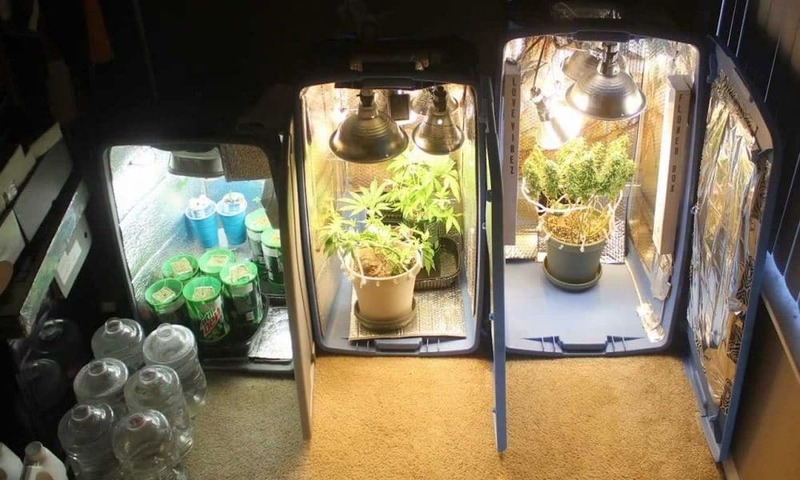 These are also called grow cabinets, marijuana cabinets, and stealth cabinets, among others. “Stealth cabinet” is my favorite term because it describes the concept of grow boxes perfectly – they are simply created to limit any unwanted attention, cast upon your weed growing adventure. But moreover, stealth cabinets also come with built-up odor-control features with the use of carbon filters. Marijuana smell can be very pungent and even if you opt for a strain, which emits less of an odor – indoor marijuana growing is always best to be kept under your control and ability to enjoy the maximum privacy of your green operation. So yes, cannabis grow boxes are, above all, 100% discreet, and that’s why we love them so much! 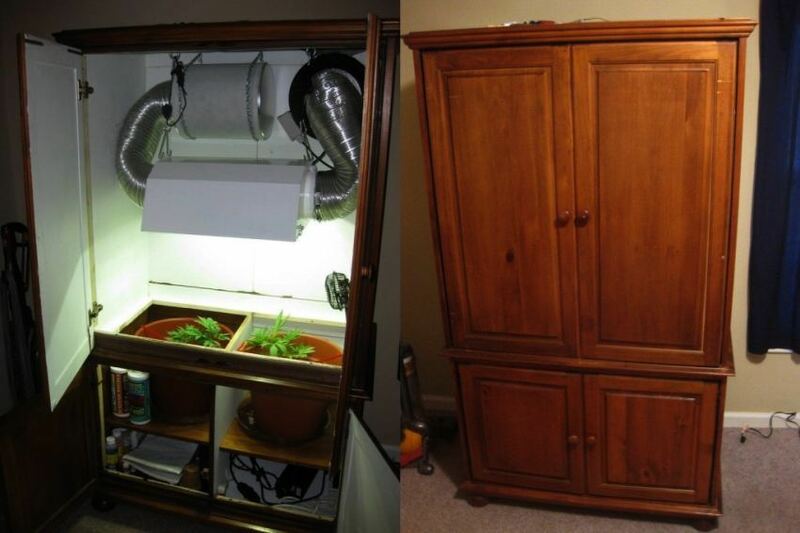 You can’t call your old cupboard a weed grow box because a real grow box comes fully-customized and all ready to use. You don’t have to start anything from scratch but rather than doing so – you just have to decide you want to grow your weed! Marijuana grow boxes already have everything you will need for a successful indoor growing operation, and even more. Grow cabinets come with filters and fans, which means the quality of the airflow will be sustained excellent. Nevertheless, they also feature effective grow lights and reflective interiors which are extremely important to help you lay your hands on those juicy, succulent buds upon harvesting. Many high-quality grow cabinets also come with pre-installed pumps, timers, and even grow media. That’s why you can find grow boxes suitable for both traditional soil growing and the trendy and yields-maximizing hydroponic growing. Some grow boxes even come with all the nutrients you will need, as well as pH adjusters, and if that doesn’t deserve a big 420-Hi-Five! And the icing on the cake is the convenient lockers which allow you to simply close your grow box and go mind your daily tasks with zero worries about the privacy of your marijuana growing setup! The locking capabilities of grow boxes should not be underestimated, and they also add up to the efficient odor control! One of the major milestones with marijuana growing is sustaining the most favorable environment during all the stages of your green beauties. But with grow boxes, controlling the right temperature, the proper air flow, as well as the access to light, and nonetheless – humidity levels – is simply a game for children. Weed boxes are designed to help you with every step of your marijuana growing journey according to your personal plan. It doesn’t matter whether you are determined to go with soil growing or hydroponics – your green babies will be safe and sound to flourish under the excellent conditions within the grow cabinets. From seeds to clones, baby marijuana plants, and flowering green ladies – a grow cabinet is simply made to help you grow your weed with ease. Yep, can’t get any easier than this. When you provide your green goddesses with the most suitable conditions, there is no other option but to end up enjoying those delicious, yummy, and sugar-coated sticky buds that we all crave for! If you want to catch the fast train to indulging in high-quality and maximum-yielding crops, you can’t go wrong with a weed grow cabinet. All in all, the complete list of devices and tools you will need to grow your marijuana plants are set, done, and waiting for you to plant your precious green babies, lay back and wait for the results upon harvesting. See, grow boxes are like automated marijuana growing machine with a perfectly innocent vision, which doesn’t remind of anything cannabis-related. Heaven sent for cannabis connoisseurs who find gardening and assembling their own indoor growing rooms from scratch too much time- and energy-consuming. And hey, we are not all born for the perfect marijuana gardeners, just like not all of us are good with maths, for example. But give weed the right conditions and it will grow like any other weed in nature – vigorously! Grow boxes are probably one of the best investments you can make as a marijuana grower because you simply get everything you need all set and done. Plus, the discreet looks can remind a classy file cabinet, an elegant storage locker, or just an ordinary safe box, among others, which means you can always keep using your grow box for anything that comes to your imagination during the periods when you are not growing the herb. No pests and bugs will attack your precious green beauties as you will have a perfectly hygienic and well-sustained environment, and that makes up for tremendous savings from the never-ending issues with various nasty little intruders that will want to snack on your buds.